New Affiliation and Registration Procedure! I just want to make a quick update to inform you guys of a new ally! 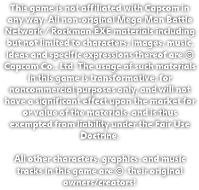 We scored a new affiliation with the folks down at RockMan Exe: Rogue Network, or just RE: RN for short. It's a roleplaying forum for everything Battle Network, so if you're into that, then give their forum the pleasure of your company. They're also a very nice group to boot, so that's always a plus! I also want to tell you that we brought back registration on the site! You'll be able to post what you think below each and every update. Give it a try with this one! See you in the next update. Ciao! Wallpaper, and.... Android Test Build! MaxRock here, making a somewhat huge announcement! I have two items that I want to give today. The first is another piece of promotional art and the other is something downloadable! As I'm sure you can guess, we got another wallpaper for you fans to sink your teeth into. This time it's...! Yep, It's Freeze Me.M.E.N.T.O. this time. If you like it, use it as your desktop's wallpaper! This second gift is something that I've been working on from soe time. Don't worry, I've still been working on Demo 4, but there were times where I couldn't. and when I couldn't I worked on this. You will all get to download and try a piece of it today! 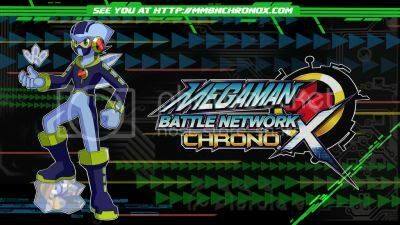 Ladies and gentlemen, I present to you... the first public test build of MegaMan Battle Network - Chrono X on the Android! It's not as extensive as the PC demos, as it only has one battle included, but nevertheless, I still want you guys to test this and provide feedback. The requirements to run it are Android 2.2 & up, 256mb of RAM, armv6/armv7/mips CPU + 17mb of free space. Hey folks, Denpa here shovin' the third gift in your faces, despite its later than expected release. Part of what makes this project as amazing as it can be is community invovement. It is a fan-game after all. The game has grown quite magnificantly and we felt that we should match that growth in how we present the project to fans and the community. And thus, we now sport this crisp, clean, webpage designed with you in mind. Features such as the Chat box, twitter feed, and contact information are available on every page for your convenince.